Last October I had my list and my packets of seeds and went out and planted the nascent greenhouse garden beds. I planted kohlrabi seed and something clicked in my head: I don’t think this is on the approved list. Sure enough, kohlrabi wasn’t on the cold-loving greenhouse list at all. What’s the worst thing that can happen, I thought. I suppose they could bolt if they don’t outright die. They didn’t die. 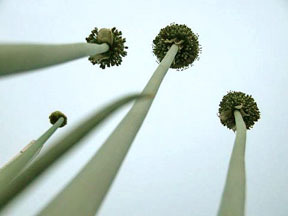 But now they’re bolting (i.e., going to seed: the plant will spend all its energy now making seed and not those lovely bulbs of yum). 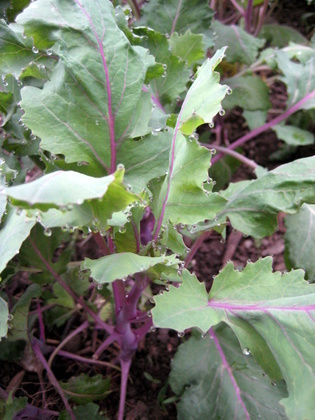 However, these plants were great sources of leaves for the winter salads. They were very mild, a little tougher than lettuce, a little less tough than cabbage. They were great, in other words. And now, well, now I harvest the whole plants, chop them up and cook them like greens. Quite delicious! Really. Sometimes, one can rectify one’s mistakes, especially in the garden. I’ve often wondered if those little seed beans that broccoli makes if you let it fully go to seed are edible? The are adorable, and they remind me of sea beans, and I’d love to discover if they are edible? I did the same thing this year, but my kohlrabi is finally bulbing up. Yay! I only have about 10 plants out there, but I’m pretty pleased nonetheless. Bolting tatsoi tastes like broccoli and is delicious, flowerheads and all. Tatsoi was the workhorse of my winter garden and I highly recommend it. Gaile, I assume you CAN eat it. Do you mean the dried-out little round seeds, or the somewhat fresh seedheads? Danielle, thanks for the mention. I looked at the rows and there are a couple of small ones (slackers, I thought) that might just not bolt and will bulb up instead. I never thinned them figuring I would simply use the leaves! Hayden: A lovely salad item. Slight cabbage-y taste, nice crunch. And sage leaves with purple stems so quite pretty to look at as well. Pattie: Yep, tatsoi is one of my favorites too. Believe it or not it overwinters OUTSIDE here too: I think it’s because it is low enough to the ground. Tatsoi is so very versatile. I stirfry them as well as use the little leaves in salads. Flea beetles here just adore them so I need to only eat them in the “off” season (winter, or greenhouse). Yeah, these look like tasty salad leaves for sure, and good on you for turning a mistake around to your advantage. I’m finding much to learn and smile about through reading your blog. My own small patch of organic garden isn’t nearly as impressive as what you’ve got going on but you’ve got me inspired now to build on what I have got. Thanks!